One May morning a few years ago, I was strolling down my garden path with a visitor from Austria when she stooped over and pinched a sprig of sweet woodruff (Galium odoratum) and held it to my nose. I detected a faint but distinct sweet hay scent from the crushed leaves. I had planted this pretty groundcover after admiring its whorled foliage and starlike flowers in the garden of a friend, who dug up a small potful for me. Now it was beginning to spread nicely around the stepping-stones and, less nicely, into nearby astilbes and hostas. My Austrian friend told me that it was a tradition in Europe to make May wine from the dried leaves of sweet woodruff, or waldmeister, as she called it. I had known that some species of Galium were used to freshen bed stuffing and church floors in the past, but I had no idea it was used as a culinary and medicinal herb. Called Maiwein or Maibowle in Germany, Switzerland, and Austria, sweet woodruff–flavored wine or punch is considered a refreshing and salutary spring tonic. We picked a couple of handfuls of sweet woodruff, and my friend rinsed and destemmed them and put the leaves in the salad spinner while I scrounged up a bottle of Riesling. After letting them wilt on a sunny windowsill for a few hours to increase the aromatics, we bruised the leaves a bit and added them to a carafe before pouring in the wine. After a few hours in the fridge and straining through cheesecloth, our May wine made a tasty late-afternoon cocktail that hinted of fresh-mown grass and vanilla. Though I’d planted Galium odoratum for its beauty and utility in filling in bare spots in my shady garden, I was very happy to find a new use for it. The aromatic compound coumarin gives the leaves their fragrance and flavoring, and it also serves as a fixative in perfume making. The scent is even more pronounced and long lasting in dried leaves, making them a nice addition in potpourri and sachets. It is also thought to repel moths. In the Middle Ages, sweet woodruff was used to treat a number of ailments, and in modern herbal medicine it is used as an anti-inflammatory and diuretic. 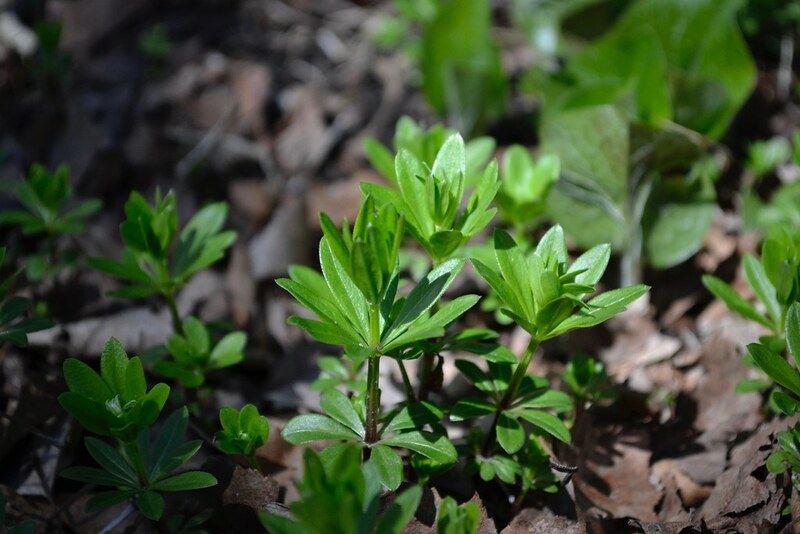 As a culinary herb, sweet woodruff is used to flavor ice cream, tea, and, of course, May wine. In Germany, waldmeister syrup is sold as a flavoring for beverages of all kinds; in fact, one of its iconic beers, Berliner weisse, is often flavored with a shot of this bright green syrup. Beyond its aromatic qualities, sweet woodruff makes a wonderful groundcover in the right place. First of all, it is a very pretty plant. The foliage grows as whorls of lancelike leaves on square stems 8 to 12 inches long and tends to flop over, forming a mat. In May, masses of tiny white, four-petaled flowers bloom above the foliage. There are several native species of Galium, but G. odoratum is an Old World species, hardy in USDA Zones 4 to 8. 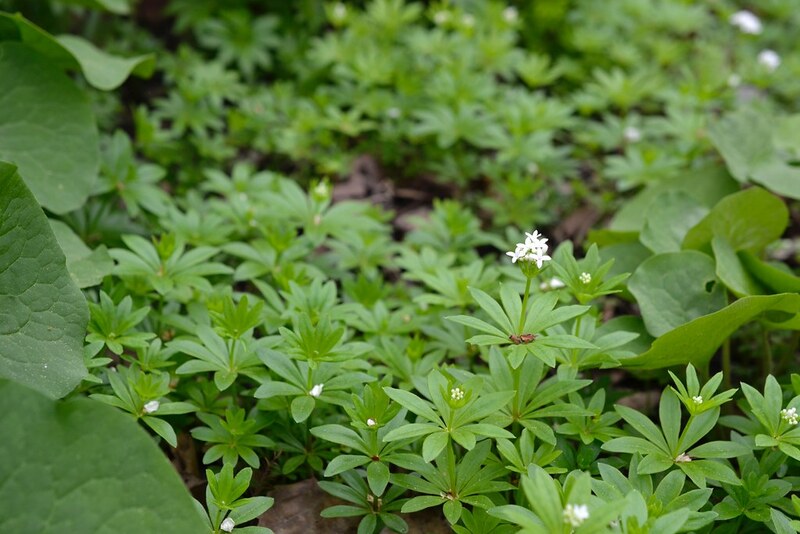 Sweet woodruff prefers moist, rich soil in partial to full shade but will tolerate dry and less-than-optimal soils. It is slow to get started but is likely to creep beyond its borders eventually, requiring mowing or hand weeding to keep it in check. Some species of Galium are downright weedy, but sweet woodruff doesn’t appear to be rampant. Nevertheless, given the chance, it will naturalize and can be found growing happily on abandoned home sites. Though it appears dainty, sweet woodruff is tough and can take a little foot traffic if grown among pavers and along paths. In the event the herb is mown, especially if it has dried out some, the area will be filled with a lovely scent, recalling another common name for it, sweetscented bedstraw. In particularly dry or sunny conditions, it may go dormant but is likely to green up again once the weather cools. It’s easy to propagate sweet woodruff if you know a fellow gardener who will let you dig up a small clump and replant it. With patience, it’s also possible to grow from seed. Potted plants are often available in the spring at nurseries, farmers’ markets, and plant sales, including Brooklyn Botanic Garden's Plant Sale. Plants can also be ordered online from White Flower Farm, Monrovia, and other nurseries. Remove the leaves from the sweet woodruff stems and wash and dry them. Allow them to wilt for a few hours and then crush them with your hands to release the aromatics. Place the leaves in a carafe and add the wine. Cover and refrigerate for several hours to several days. Strain before serving. Garnish with strawberries if desired. Some recipes call for sugar and sparkling wine or brandy to make a punch. Galium odoratum (sweet woodruff). Photo by Blanca Begert. Galium odoratum (sweet woodruff) in bloom in May. Photo by Blanca Begert.